The process industry is seeing manufacturing structures change, production chains becoming global and higher requirements placed on manufacturing processes. Businesses need to adapt to declining sales volumes and the demand for more specific product characteristics. They find themselves under constant pressure to produce with greater cost-efficiency, speed and flexibility to cater for the needs of regional markets. Especially in highly regulated sectors such as the pharmaceutical industry, long lead times are commonplace and thus represent an important starting point for optimizing processes. One methodical approach to optimizing manufacturing processes is to reduce the lead time. That may sound simple but it isn’t because each individual sub-process has to be looked into for possible reductions or optimizations. Lean manufacturing offers a number of useful methods, techniques and tools for optimization, although some methods to reduce the lead time were already in use before the age of lean manufacturing. One of those was the process flow analysis which subdivides the process according to the proportions of, for example, processing, transportation, inspection, delay and storage. However, many projects could not be successfully implemented at the time because of the lack of a holistic, comprehensive approach. 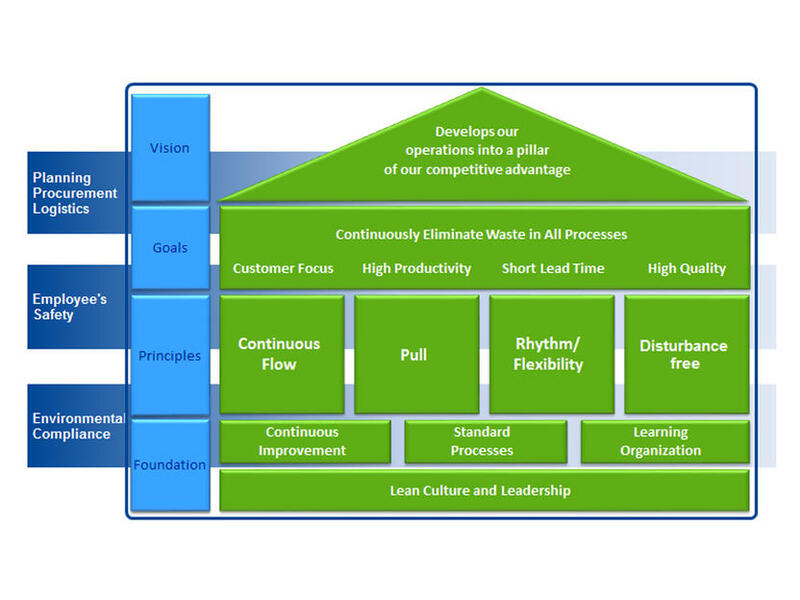 The “lean” philosophy, which originated in the Japanese car industry, now involves the entire organization in reducing the lead time, thereby boosting the chances of success. Fig. 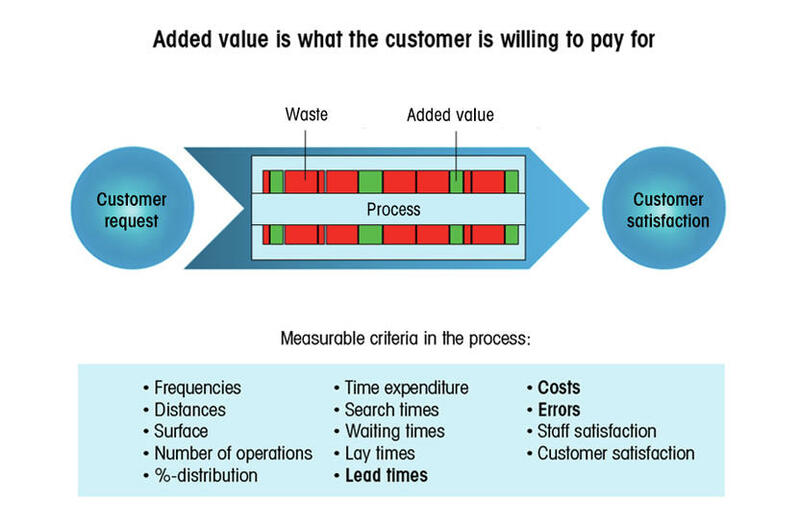 1 Measurable process criteria – Value-adding activities are at the center of process optimization based on “lean” criteria. The measures are aimed at reducing waste. The lean production concept was originally developed by Toyota and described in the early 1990s literature. It became known as the Toyota Production System (TPS) [1,2]. The competitive advantages generated by this approach were publicized in a study of the Massachusetts Institute of Technology (MIT) [3,4] and subsequently became familiar as so-called lean management. The methods are aimed at rigorously avoiding waste during the process ("Muda" in Japanese) to reduce long lead times and their associated costs. At the same time, it is important to ensure high quality throughout. “Lean” measures focus on value-adding activities or process steps and aim to prevent wasting resources – particularly time (see Fig. 1). Experience over many years has proved the assumption wrong that this cannot be transferred to a highly regulated GMP/GLP environment. The “lean” principle is not primarily about increasing the staff’s workload, which would pose a risk to quality. It is not aimed at making the personnel work harder but more efficiently. It is the human being that is at the center of this approach. Deviations in the main process – dealing with those is QC’s prime task! The main processes should possess a first pass yield (FPY) of at least 95%. Even if so, this does not mean that they are necessarily efficient (i.e. lean). FPY, as a variable, can quantify the number of released batches per full-time equivalent (FTE) or the number of clearances without process deviation, to give just two examples. Process delays self-induced by the laboratory are other possible causes that need to be considered. These can be due to, for example, authorizations that take too long as a consequence of lab staff shortages, analyzers that are not ready for use, laboratory consumables or chemicals that have run out or, generally, processes that are not set up to be lean in the first place. 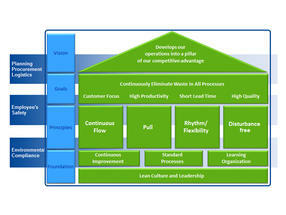 For manufacturing processes, the strategic approach of choice over many years now has been to optimize lead times [cf. 5]. State-of-the-art lean concepts have been successfully established and can readily be transferred to the laboratory environment. This includes all pharmaceutical, medical and chemical laboratories. Many, if not most, of the most important principles of traditional lean techniques apply just as they do to manufacturing. These are often placed in a holistic context and are illustrated as a column model or a so-called lean house. From this, we have derived a lean house model specifically for the lab environment (Fig. 2). Quality assurance and control (QA/QC) are essential for creating value in businesses. Problems arise when a laboratory sees itself as a separate entity and the impact of its processes on production is not taken into account. 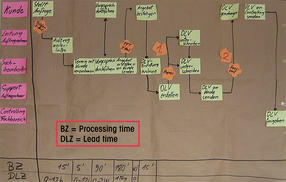 One way to optimize this interface is through value stream mapping, a lean management tool used to understand processes. The aim is to examine all necessary processes of a business with regard to lead times, inventories (material flow) and interface communication (information flow). 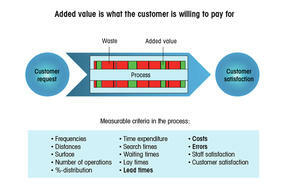 The key figure in a value stream analysis is the net processing time as a proportion of the entire lead time. The total lead time may be two weeks, even if the actual processing time may only be 15 minutes. The remainder are down times, waiting times, clarifications – in short, time during which no value is created. This should be avoided or at least reduced (see Fig. 3). The identification of value-adding and non-value-adding work operations, visualization of the workload (Kanban board), motion analysis (spaghetti diagram), etc. Fig. 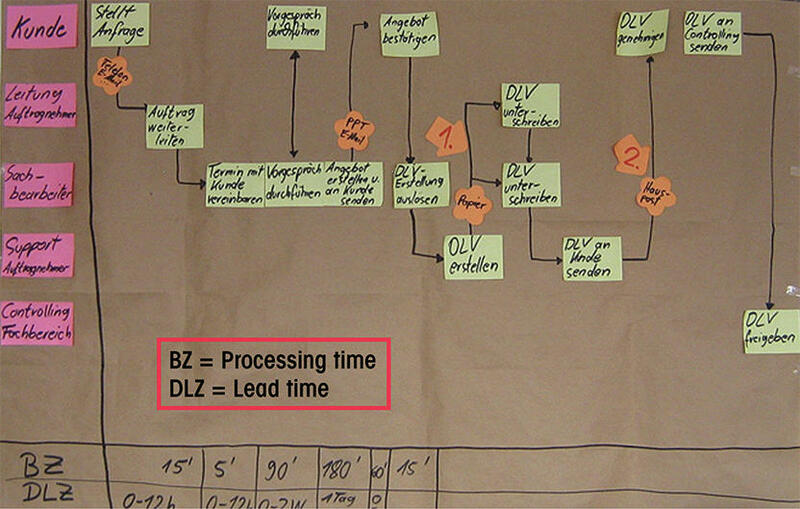 4 Example of process mapping. A value stream analysis is carried out in eight steps: 1. Define customer data, 2. Enter the functions/positions involved, 3. Determine the process-triggering positions, 4. Record the basic process steps, 5. Evaluate the process steps, interfaces and information flows, 6. Record the external flow of materials and services, 7. Record the timeline including processing and lead times and 8. Identify the first areas where action should be taken (see Fig. 3). Benchmarks or reference values ​​help to assess the measured sub-process steps in a laboratory and to identify starting points for “lean” measures. Take for example laboratory balances or a titrators, whose setup and changing time has to reach less than ten minutes. The duration in the laboratory has been found to be much longer, despite the value-adding net measurement time being only three or four minutes. The devices are calibrated daily, even though regulations or standards such as USP Chapter 41 allow for longer intervals. However, this is not used. Testing more than necessary also increases the risk of faulty device checks and documentation. On the other hand, failure to service equipment at regular intervals, in an attempt to reduce annual maintenance costs, may result in devices measuring significantly slower over time, which may not be detected or considered. The focus has been on the wrong issues. If the findings from a value stream analysis are rigorously pursued, set in a guideline and implemented, an efficiency increase amounting to one hour per day of routine laboratory work can be achieved quickly. The simplest and smallest of changes can bring about the most effective improvements. Implementing a lean management approach in the laboratory offers economically viable and easy-to-implement methods to optimize workplaces and processes. A key aspect is reducing lead times. Optimization should begin with a detailed analysis of the workflows, encompassing all workplaces and processes. Erwin Studer, who is a managing partner of profact AG, Switzerland, has advised Mettler-Toledo on lean management and process optimization with his laboratory-related know-how. Daniel Fuchs is a specialist in lean management for Services at Mettler-Toledo. Work in process (WIP): The name for raw materials, materials and components that stream into production and, as semi-finished products, wait to be completed. Their values ​​are currently not recognized in the inventory. Muda (jap. ): Waste or a non-value-adding activity or work step. No added value for the customer.